Sime Wing Impact Drive Sprinkler is constructed with a heavy cast aluminum body, aluminum drive arm and brass lower turning union. 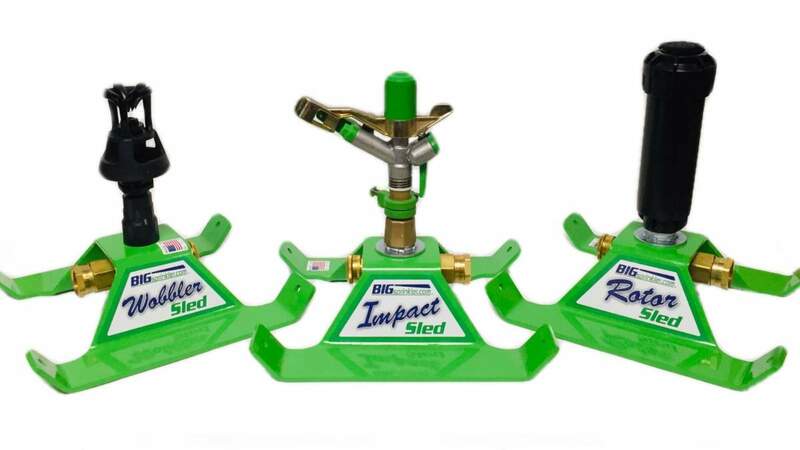 Features include adjustable stops for full or part circle coverage and a quick change nozzle setup all supported by a 2" female standard pipe thread connection. Includes a set of nozzles included to accommodate 40 to 200 gallons per minute and coverages up to 155 feet in diameter. It features the new style drive arm that operates in an up and down motion instead of the side to side motion reducing vibration on stand pipes and operating on a variety of slopes. The Wing is a low angle 18 degree trajectory sprinkler used in applications where the sprinkler needs to be mounted very high such as on the end of a center pivot irrigation system. See specifications tab for full performance information. **These calculations are theoretical test numbers under perfect conditions and do not take into consideration wind, terrain, or other natural acts of nature. What is PSI and GPM? Water pressure is measured in pounds per square inch–also known as psi. It is commonly referred to as “pressure”. Water pressure varies from home to home and it is important to know what your pressure is when buying new sprinklers. Flow rate is measured in gallons per minute–known as gpm. Your flow rate is how quickly water–flows from your spigot or pump through the hose and to your sprinkler.